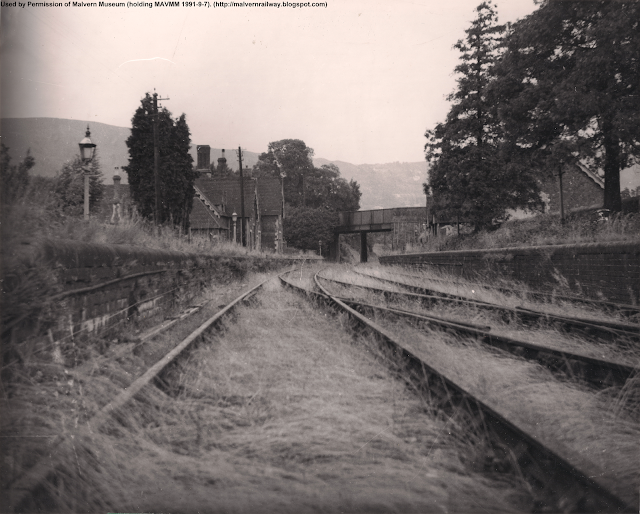 While this picture shows the additional spur which linked the station to the old turntable outside the Imperial Hotel. 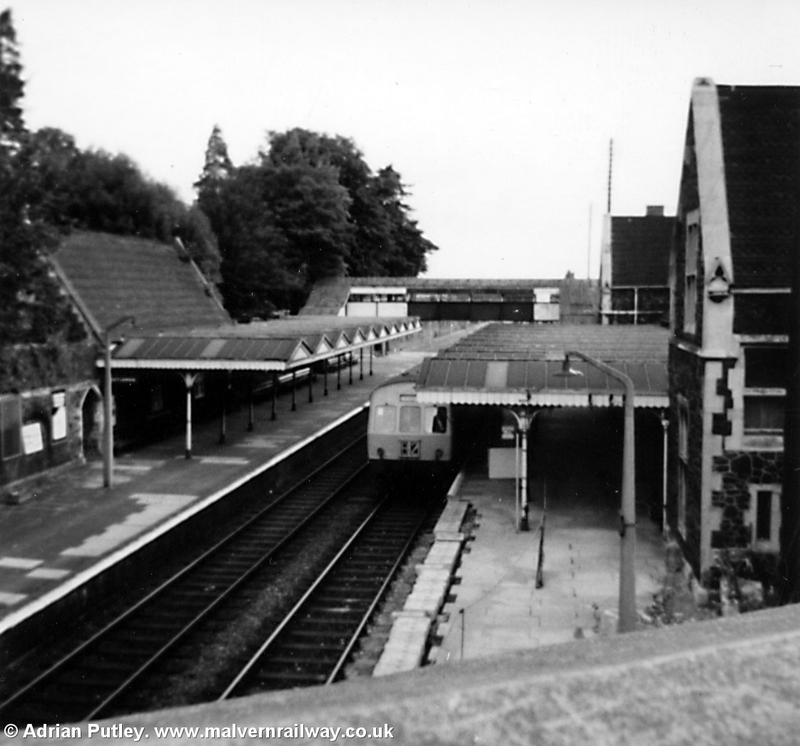 Zoom in to the right of the train and the end of the platform to see the spur. 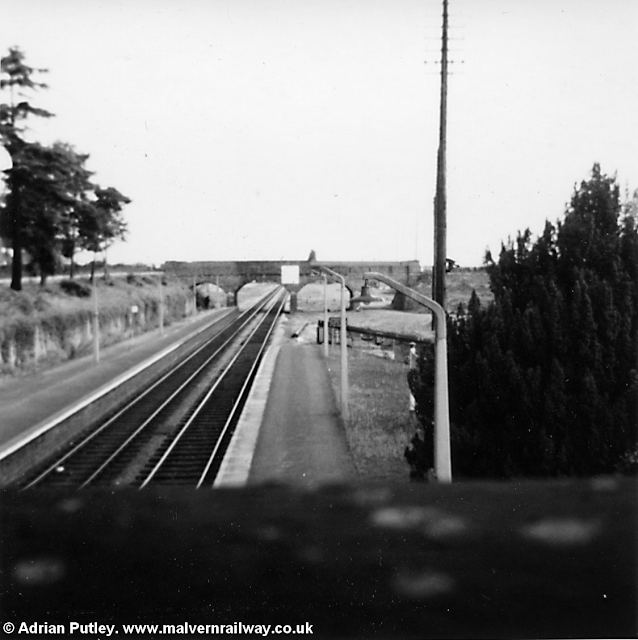 Finally, a nice view from Avenue Road bridge, taken in 1967. 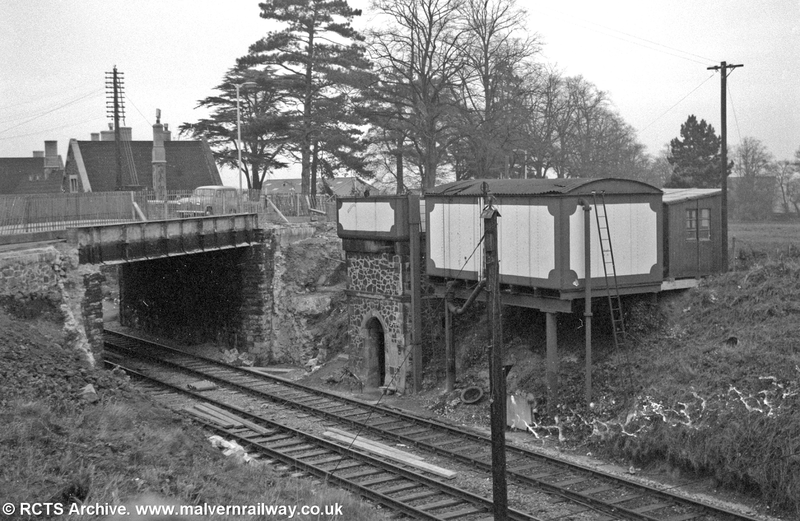 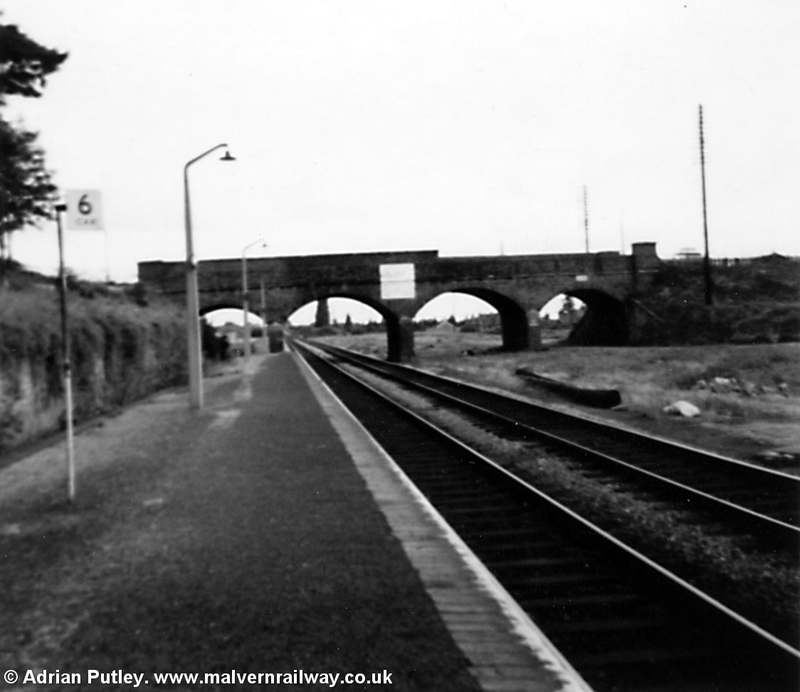 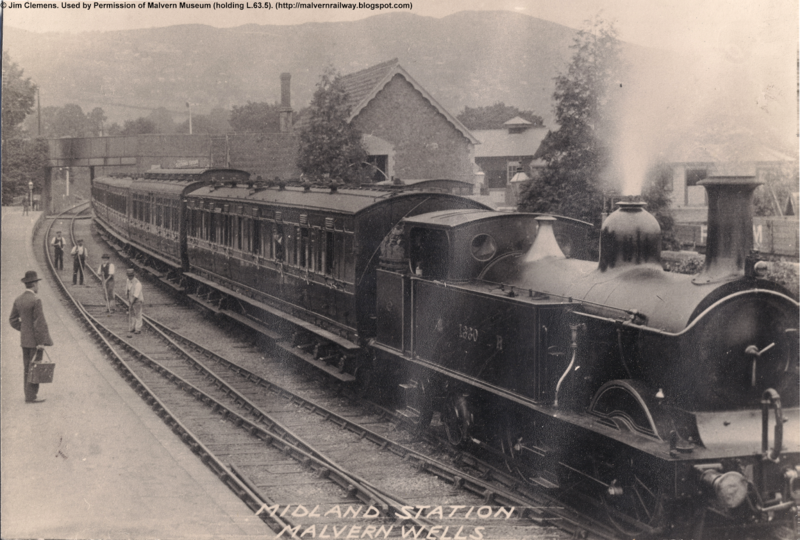 Malvern Link was first connected to the railway in 1859 as the terminus of a line down from Henwick, outside Worcester. 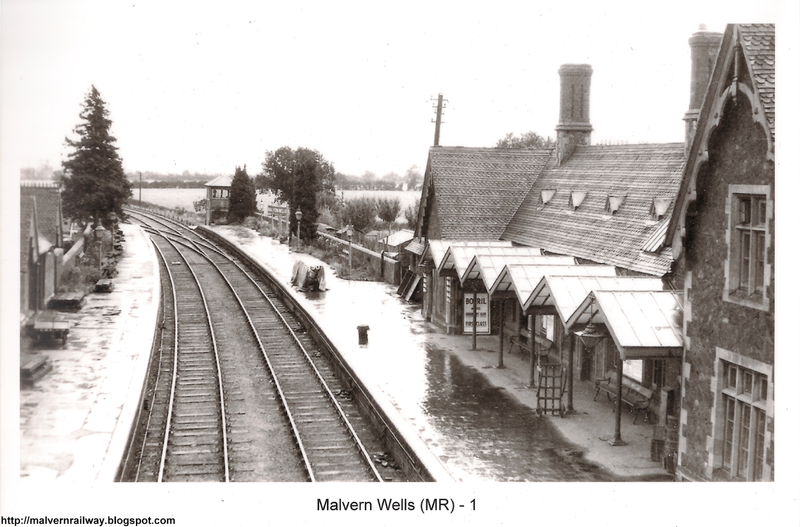 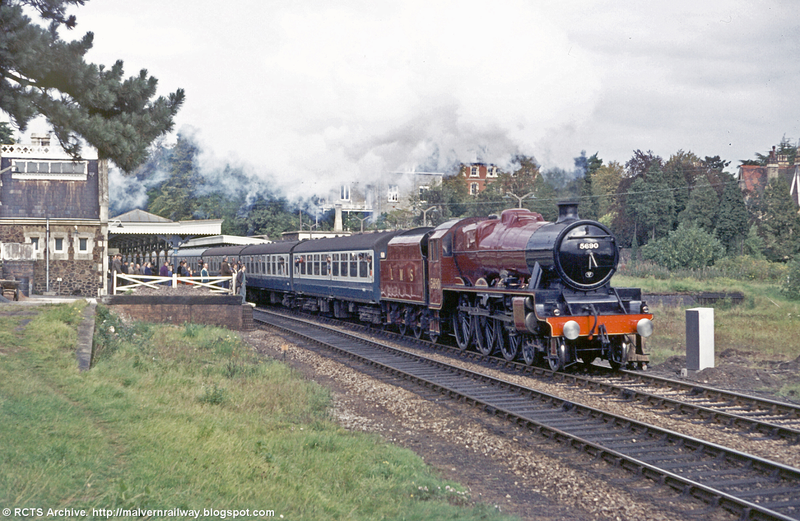 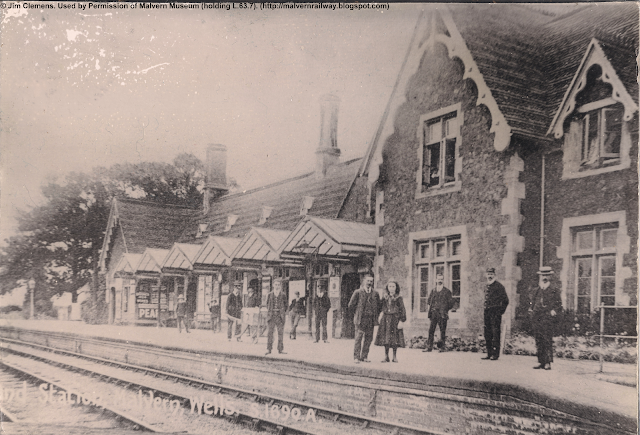 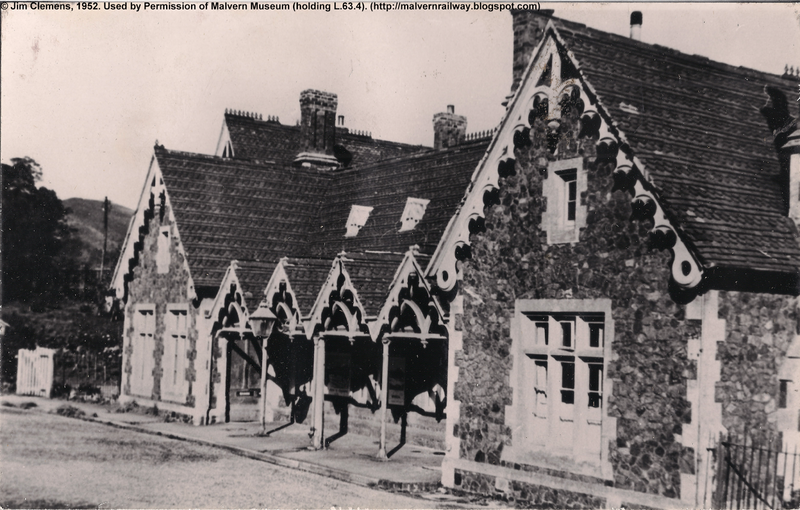 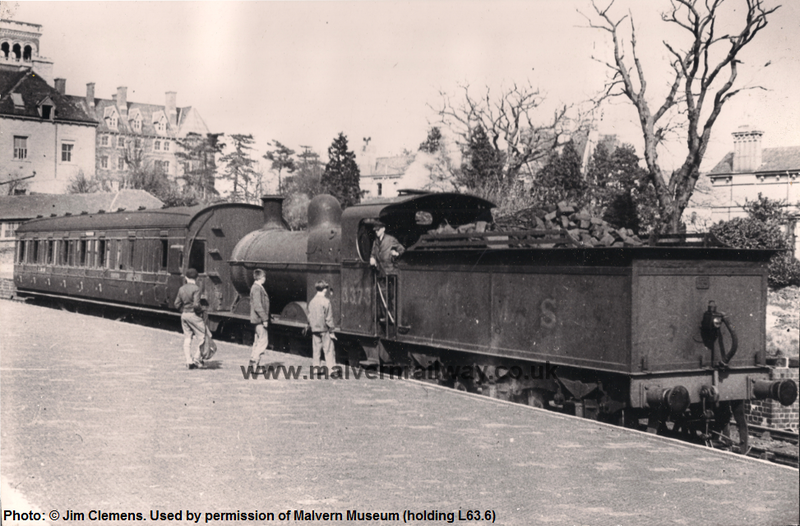 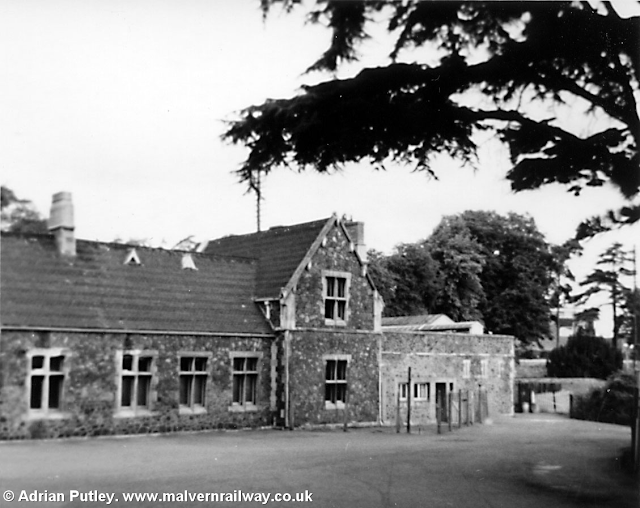 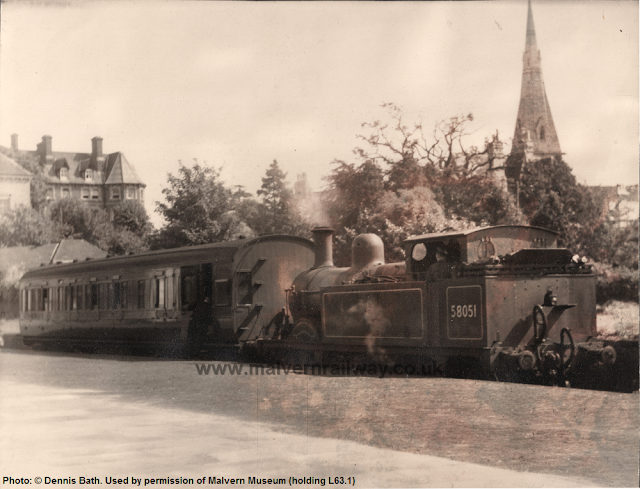 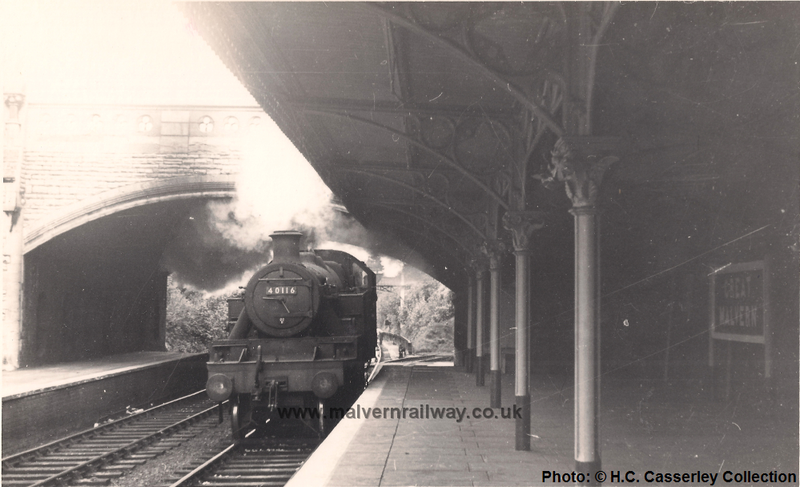 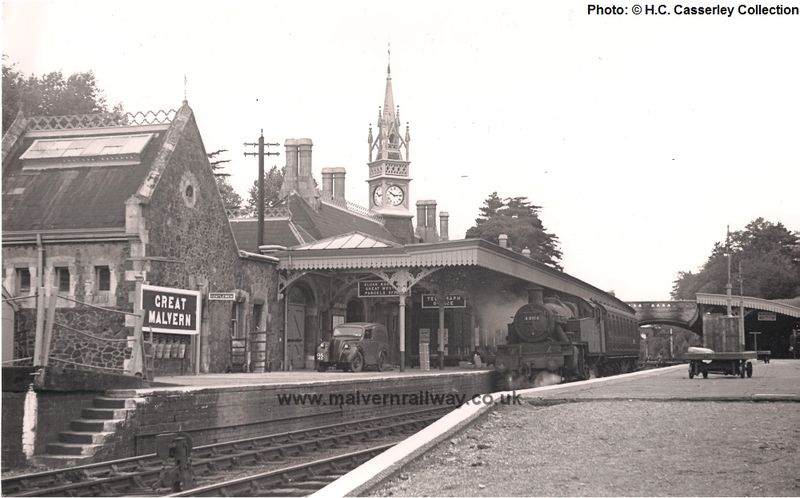 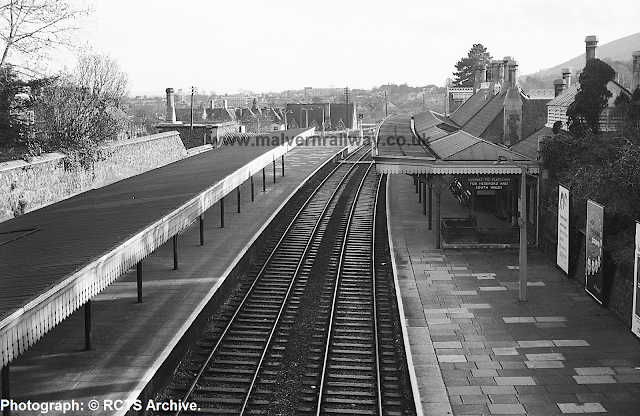 The following year a permanent station was built and the line extended to Great Malvern and Malvern Wells. 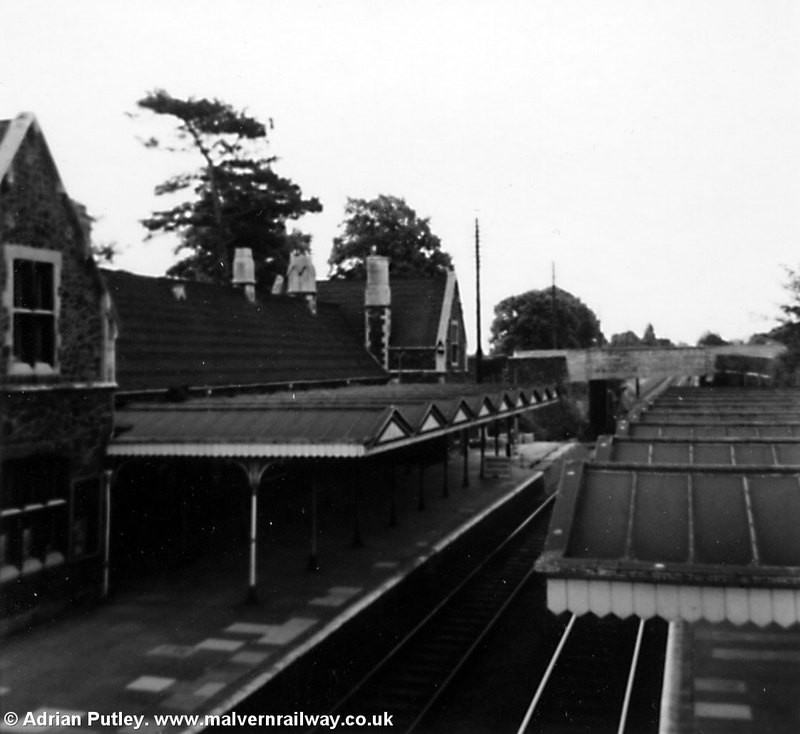 The original station was allowed to fall into disrepair and was in large part demolished in the late 1960s and early 1970s. 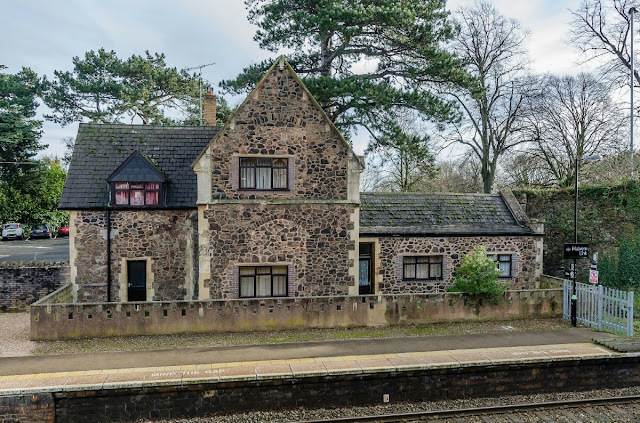 Today, the station has been given a new lease of life through a series of renovations designed to restore some of the building's original Victorian look. 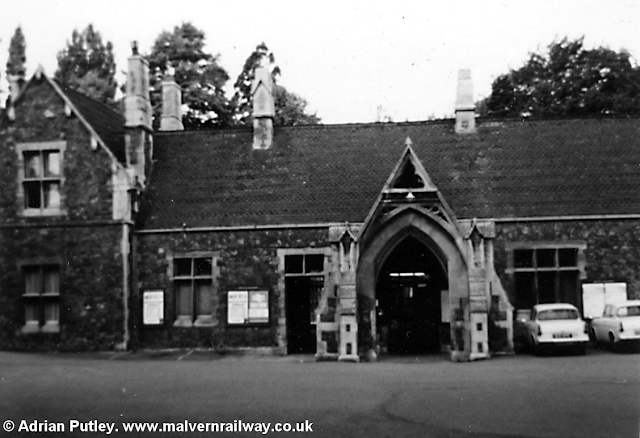 London Midland and Great Western services continue to stop here and usage of the station has been slowly growing in recent years. 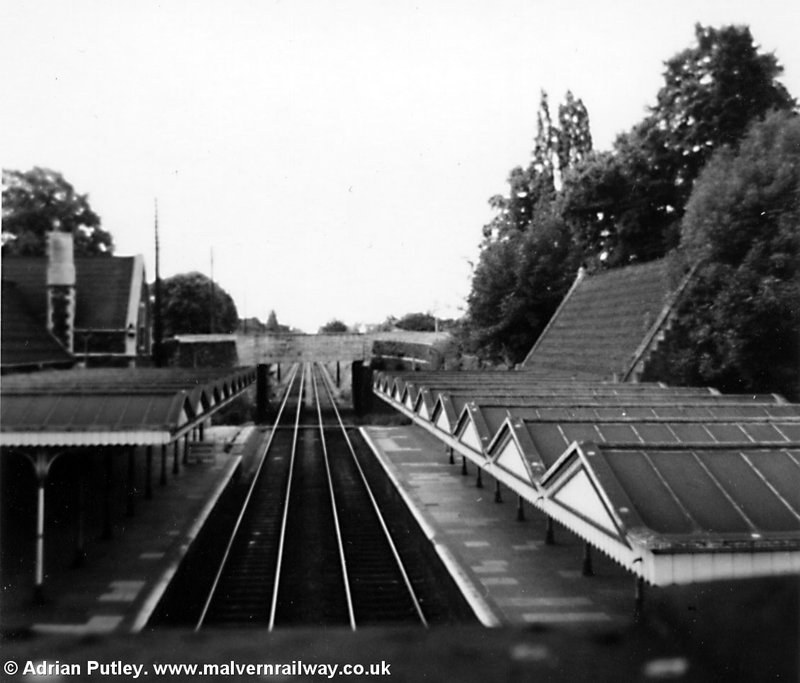 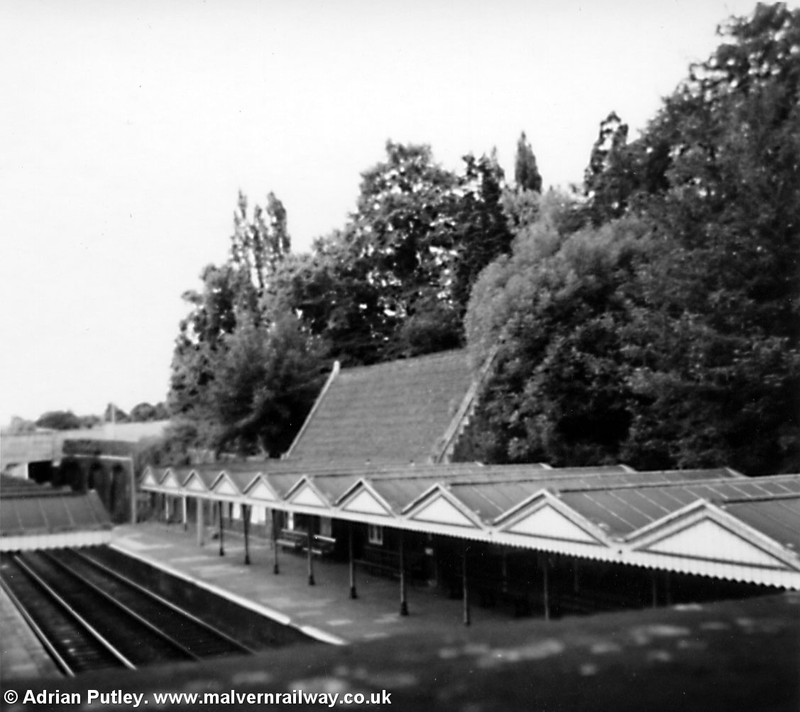 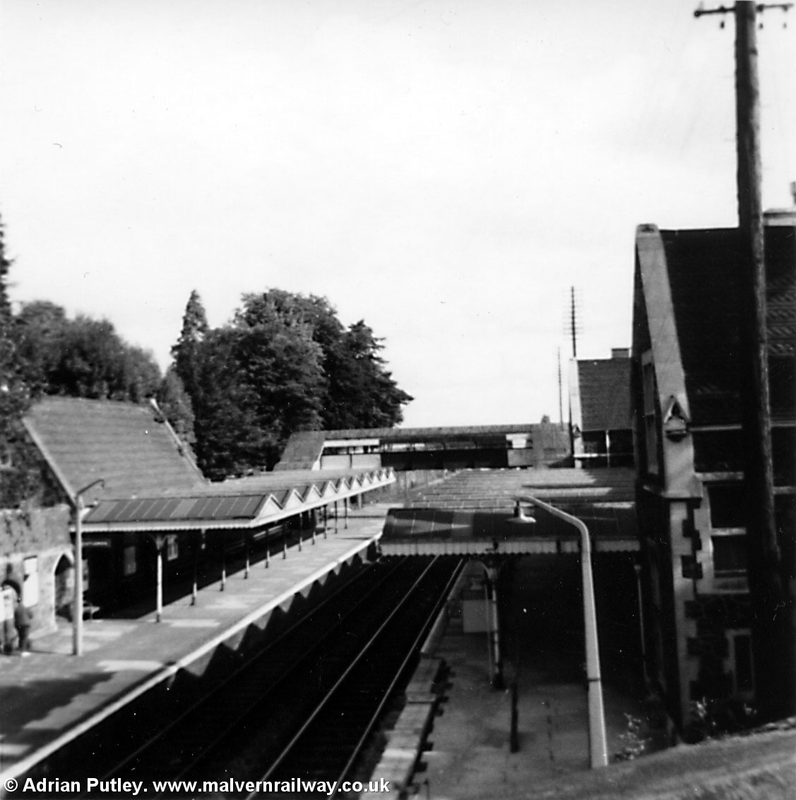 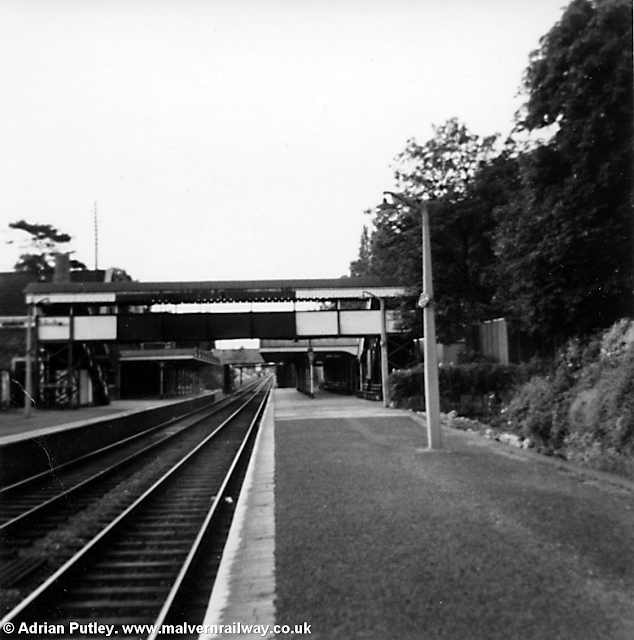 These pictures of the original Malvern Link station come from Adrian Putley, who has kindly given me permission to show them here. 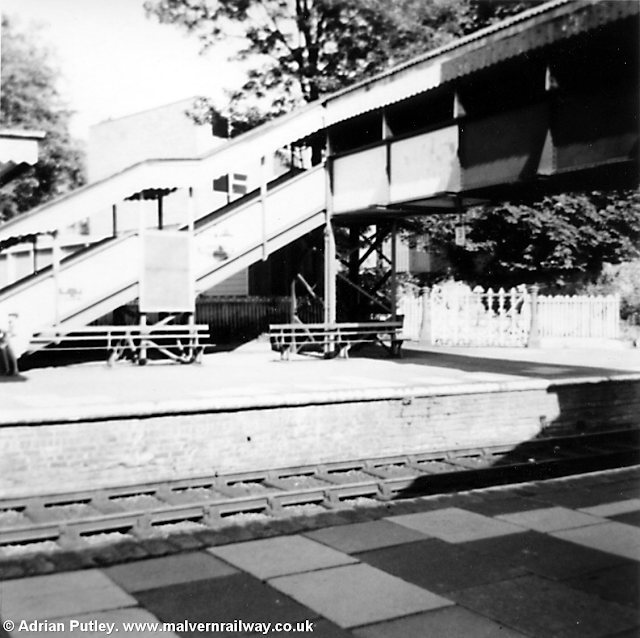 The pictures were taken in July 1970, shortly before the demolition process was completed. 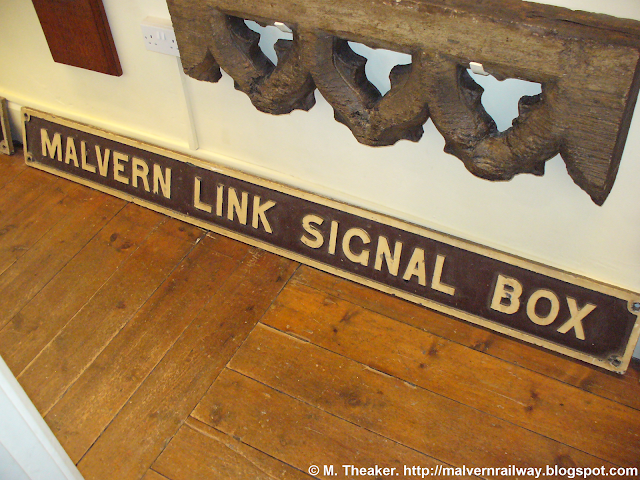 The old signal box sign at Malvern Museum. Although Malvern Link station was not technically part of the Malvern-Ashchurch railway, this opportunity was too good to pass up. 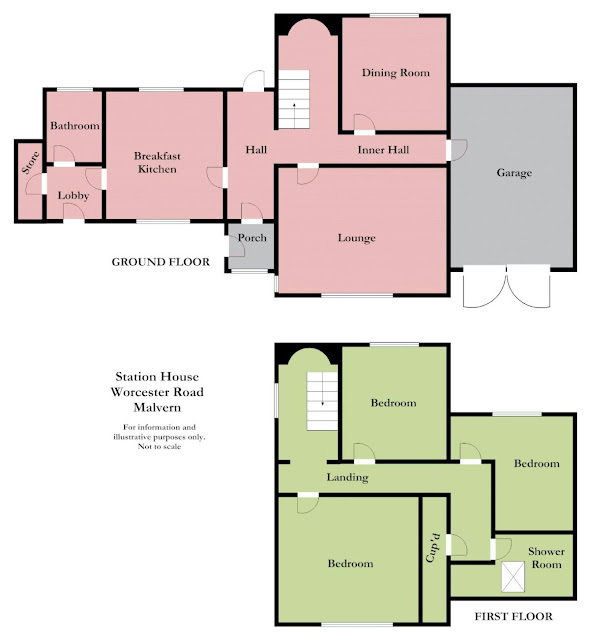 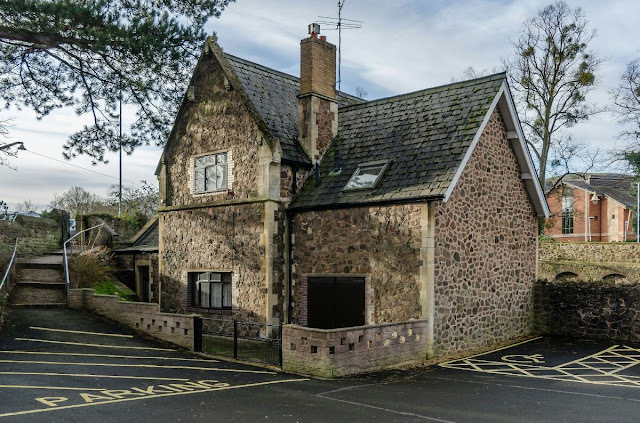 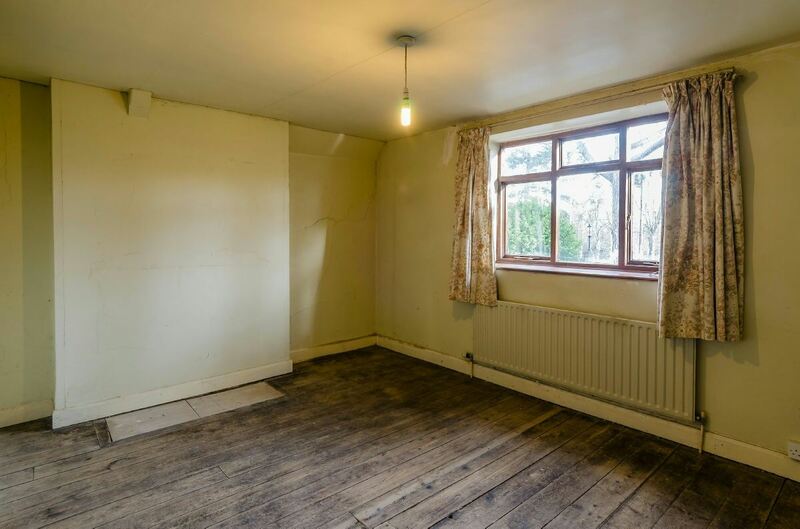 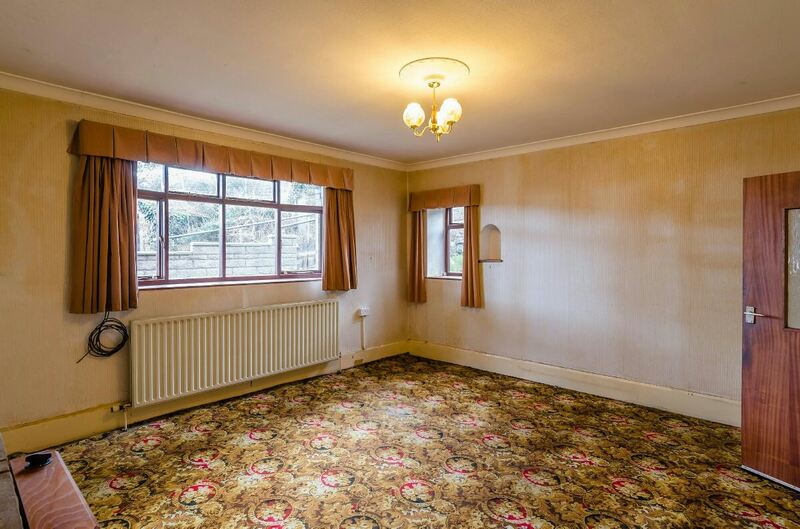 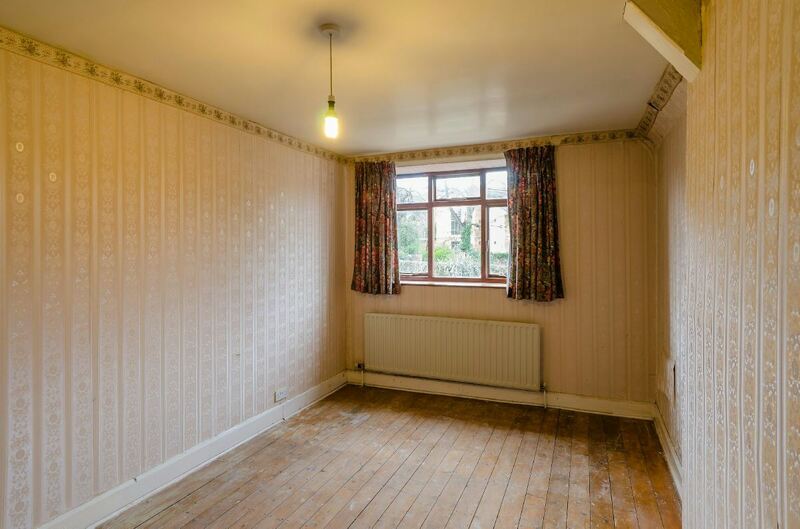 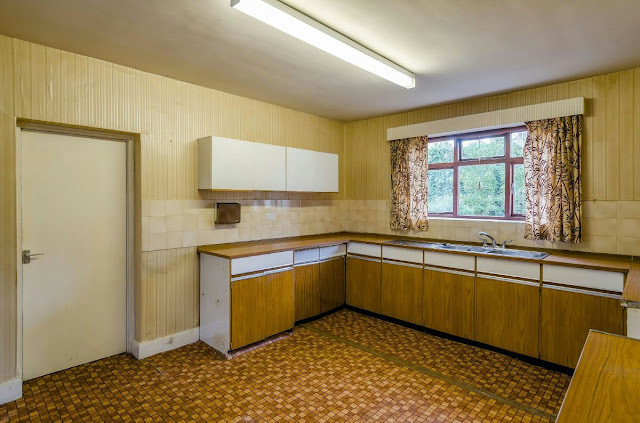 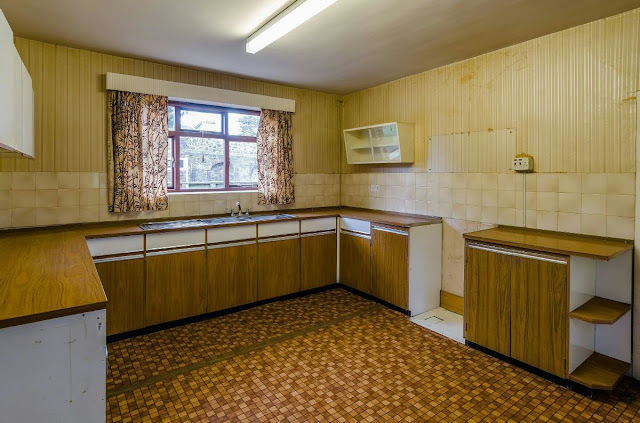 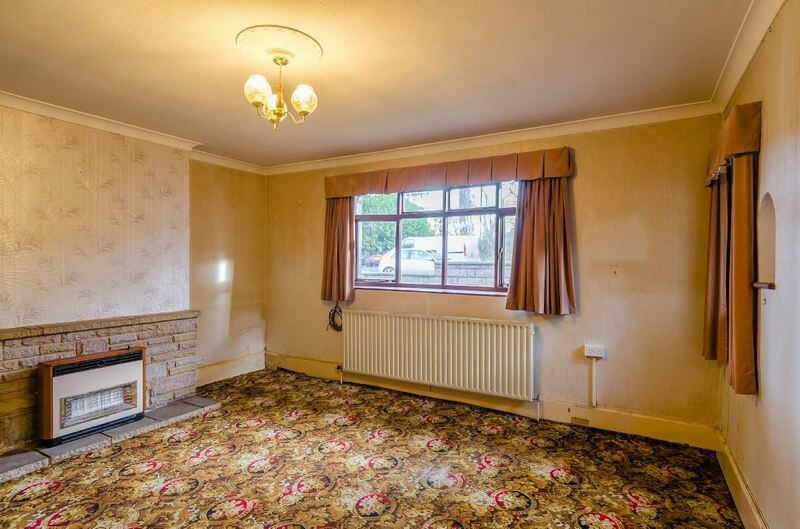 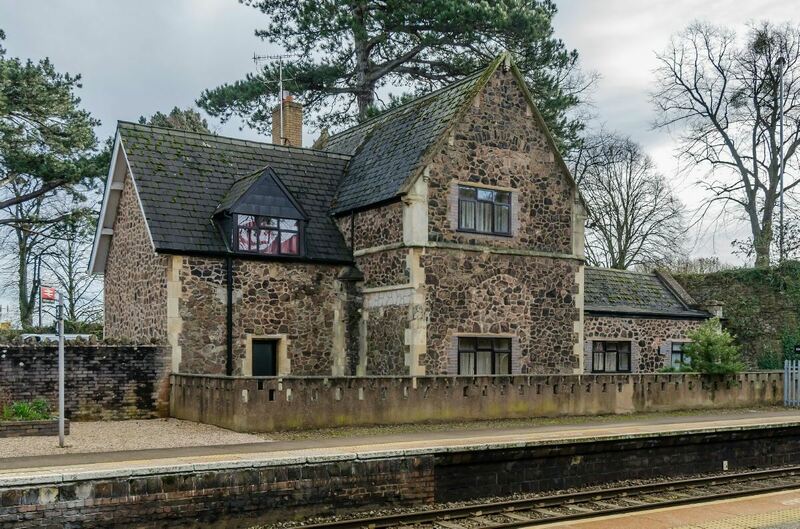 The former station master's house at Malvern Link is being marketed by John Goodwin for sale as a private residence, which gives us the chance to take a look inside. 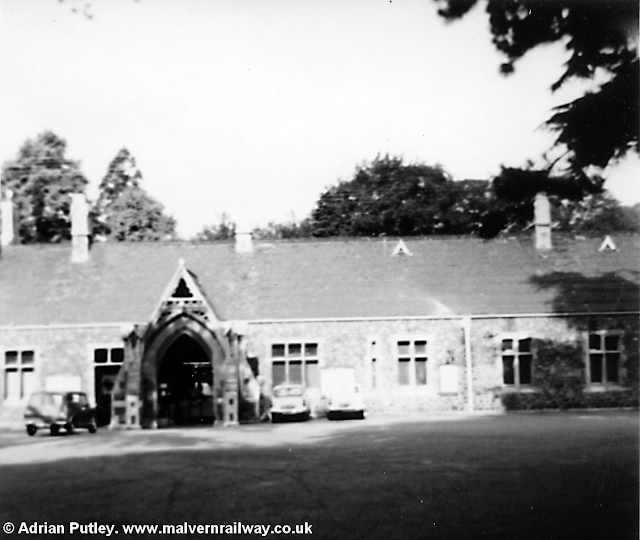 Just a quick update to show off the fruits of the last few weeks' research - seven new pictures of Malvern Hanley Road! 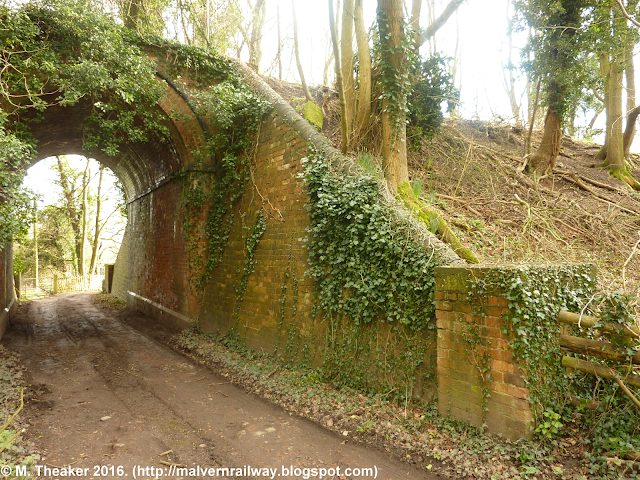 The pictures will all be added to the original post for Hanley Road. 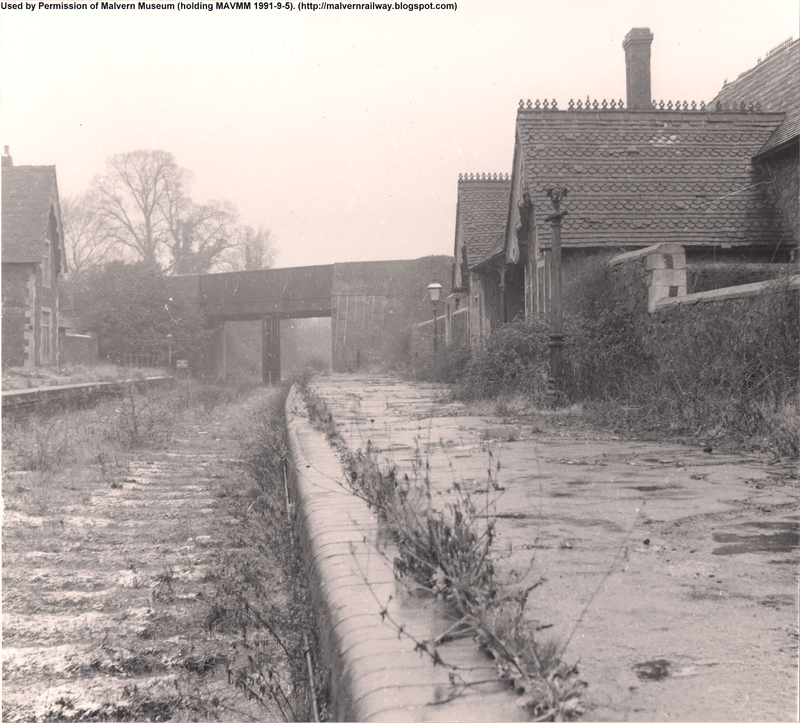 This first shot, taken from Hanley Road bridge, was obtained from Ebay. Author and date unknown, but clearly taken pre-closure in 1952 because the rails are still intact. 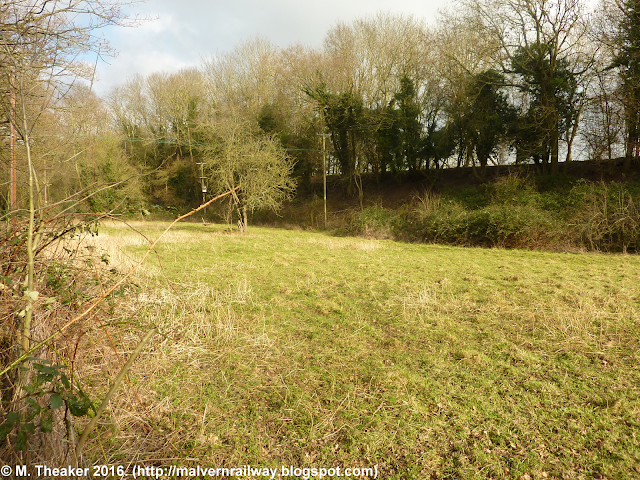 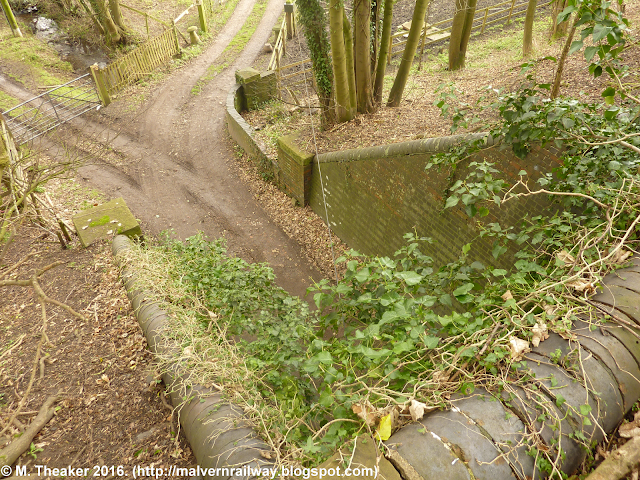 Probably my favourite part of the old Malvern-Ashchurch railway is the section between the derelict bridge on Worcestershire Golf Course and the top of the Three Counties Showground near Hanley Road. At this point, the Midland branch settled into a long straight section with a constant downward gradient as the route descended from the Malvern Hills in preparation for the eastward swing towards Upton and the flatter land around the river Severn. Although barely half a mile long, the route quickly throws up some dramatic shifts in landscape as you walk south away from Malvern. 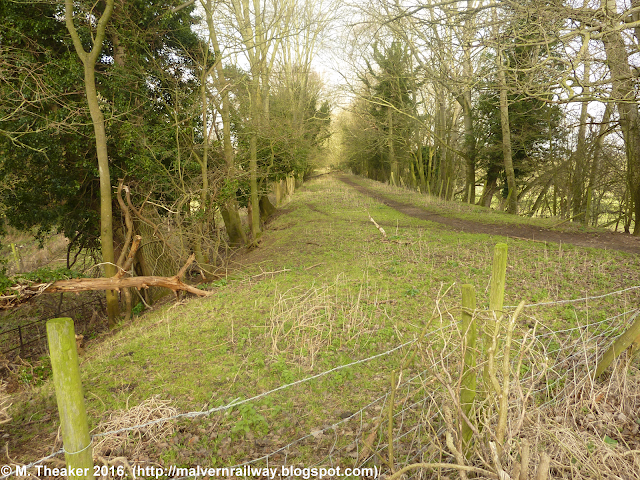 Heading first into a deep cutting, the route continues onto a high embankment and crosses a tall bridge before descending onto the plain cleared for the Showground site. 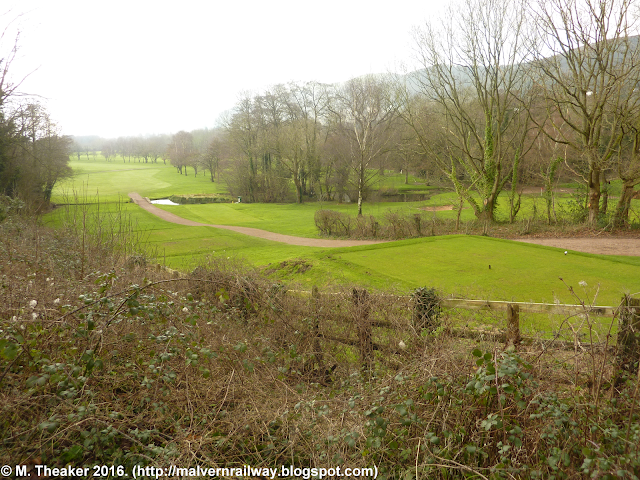 What makes this route special is that it is essentially a steady and gentle straight line driven artificially through the landscape: for regular walkers of the Malverns, used to climbing immovable hills, it is a very different experience to walk along a level path and to see the landscape move around you instead! 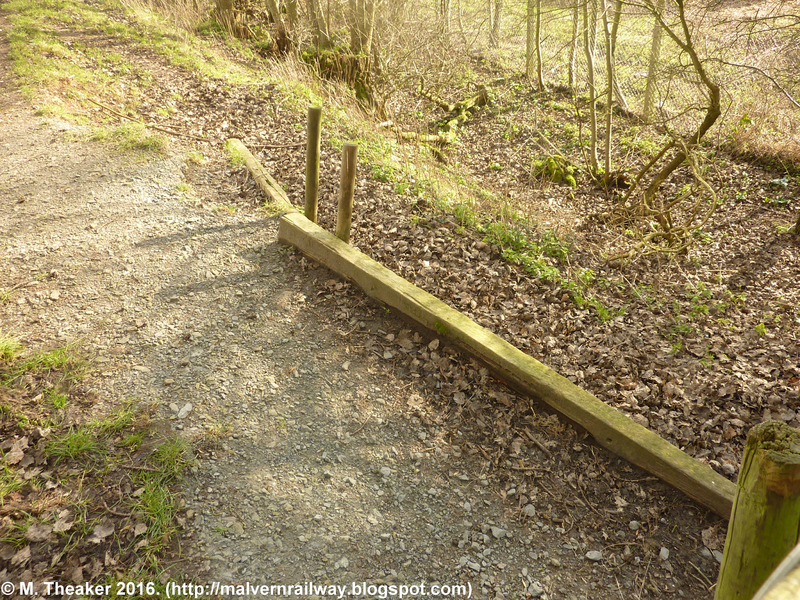 The first part of the walk after the golf course bridge is reasonably flat, but the landscape soon rises around the line to form a steep cutting engulfing the route. ... before rapidly becoming very deep. 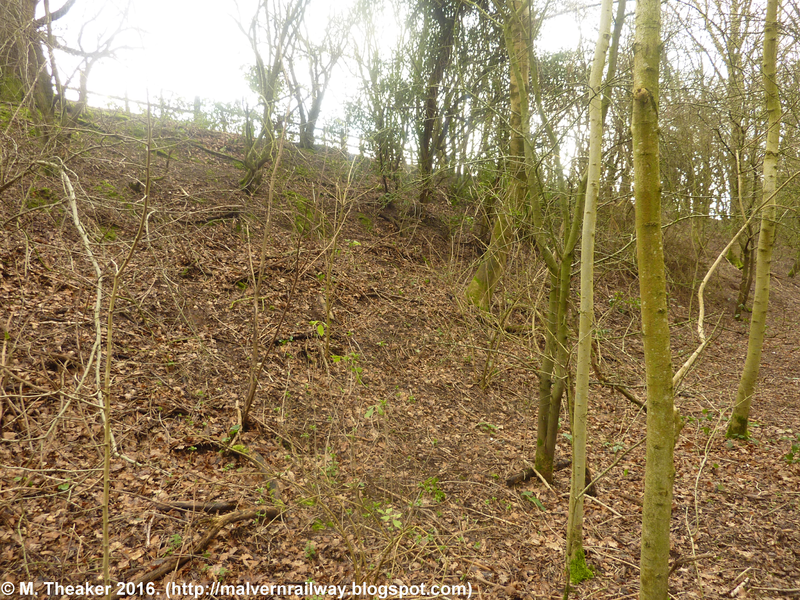 This part of the line is a haven for wildlife - small trees and bushes provide an ideal habitat for birds, while the deep slopes either side are full of rabbit holes. 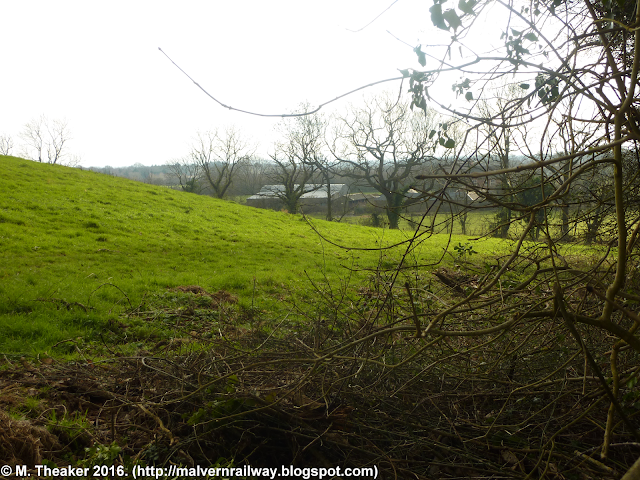 At this point the landscape begins to switch as the hill surrounding the line gives way to a gentle valley. The incline of the railway is shallow and constant, it is the countryside that changes! 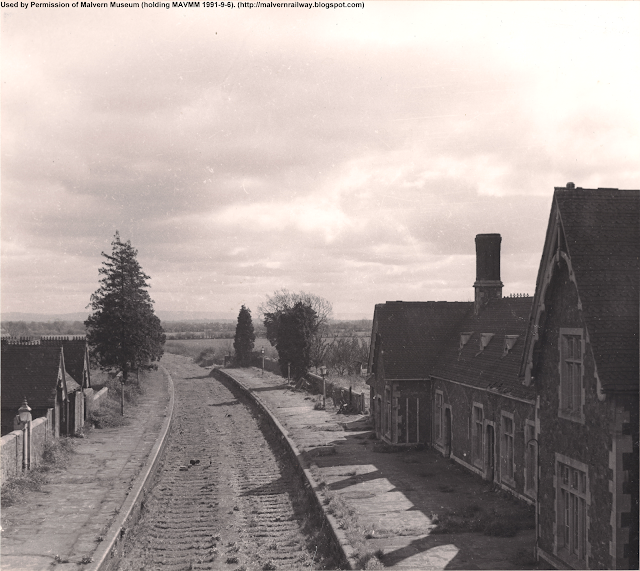 The end of the cutting. 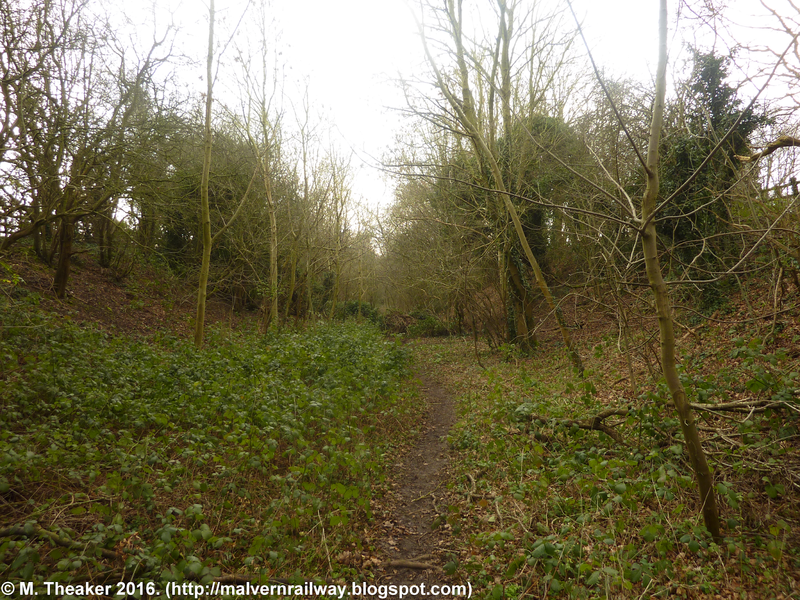 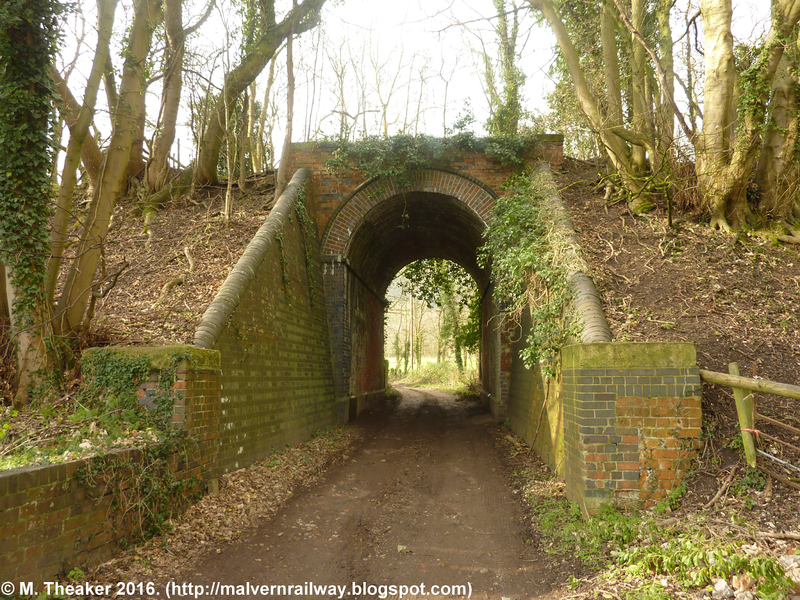 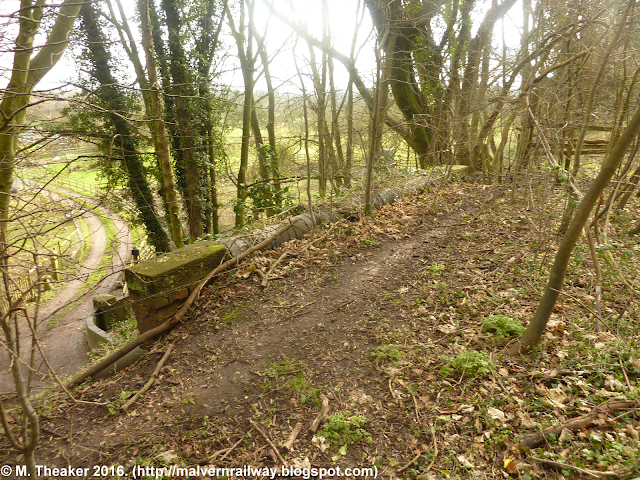 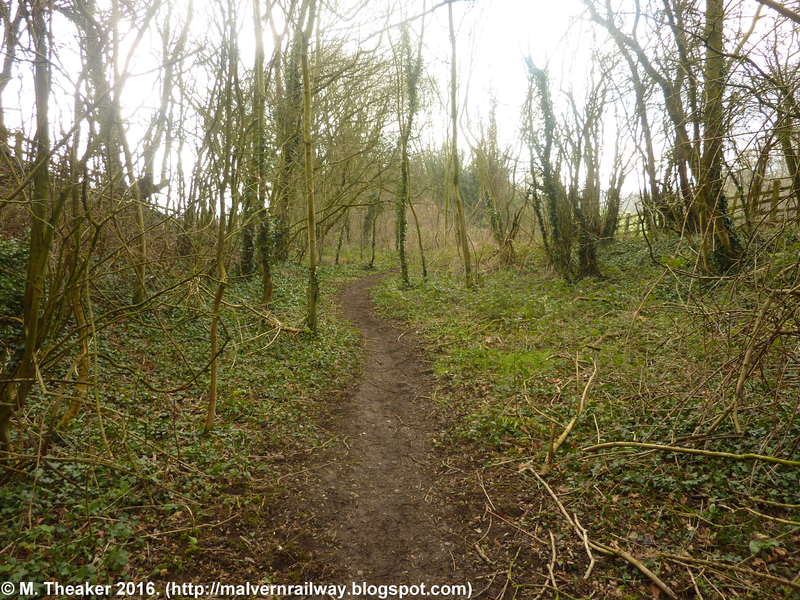 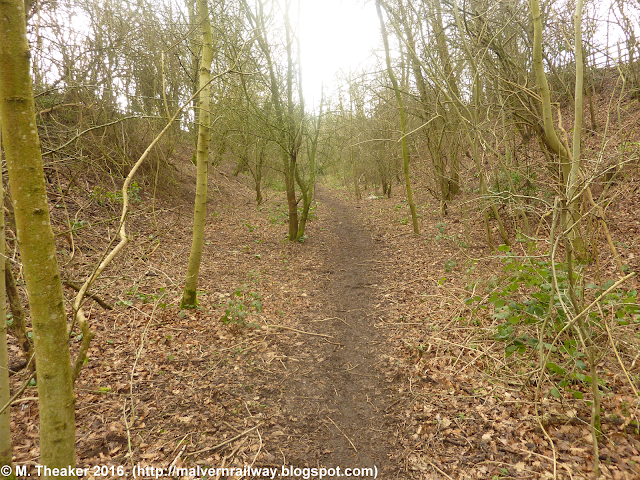 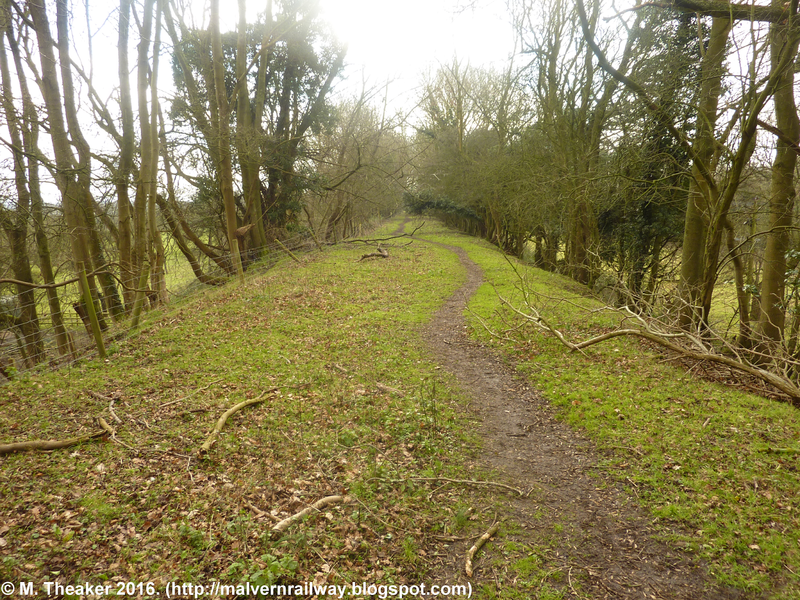 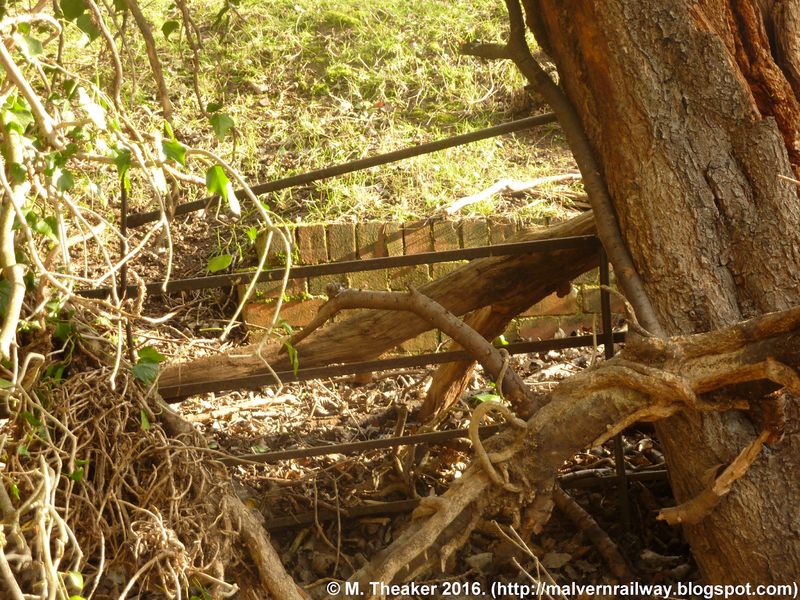 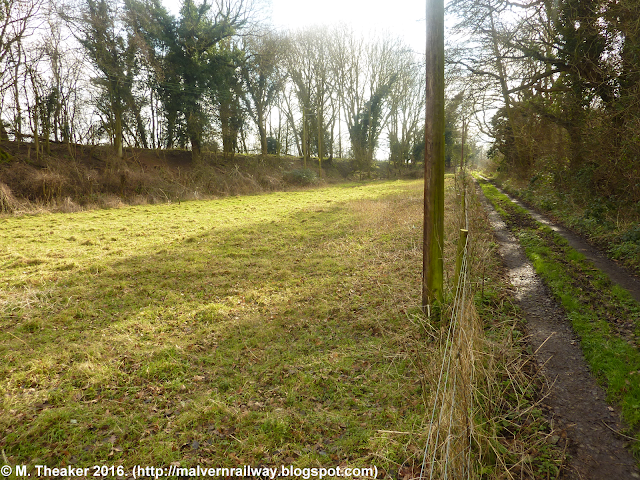 One of the most spectacular remains of the old railway can be found at Warren Farm, where the route runs out onto a very tall embankment complete with a high arch bridge to maintain access to the farm from Hanley Road. 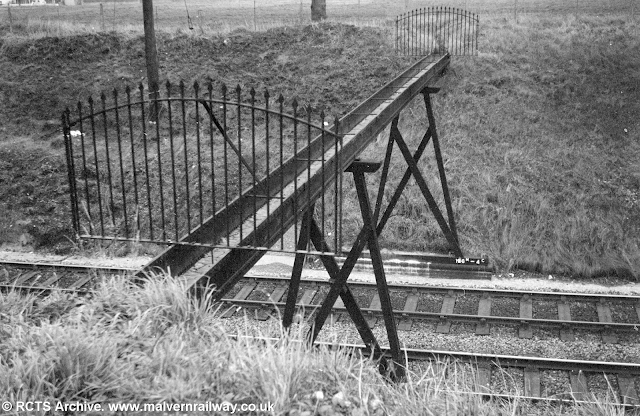 The section immediately before the bridge overlooks a stream which has been incorporated as an obstacle on the golf course. 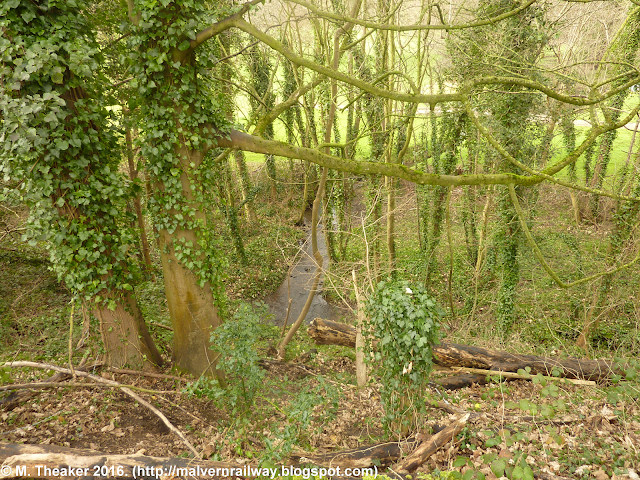 The stream is quite large and runs through the embankment - presumably it is the reason for all the old drainage culverts scattered about. 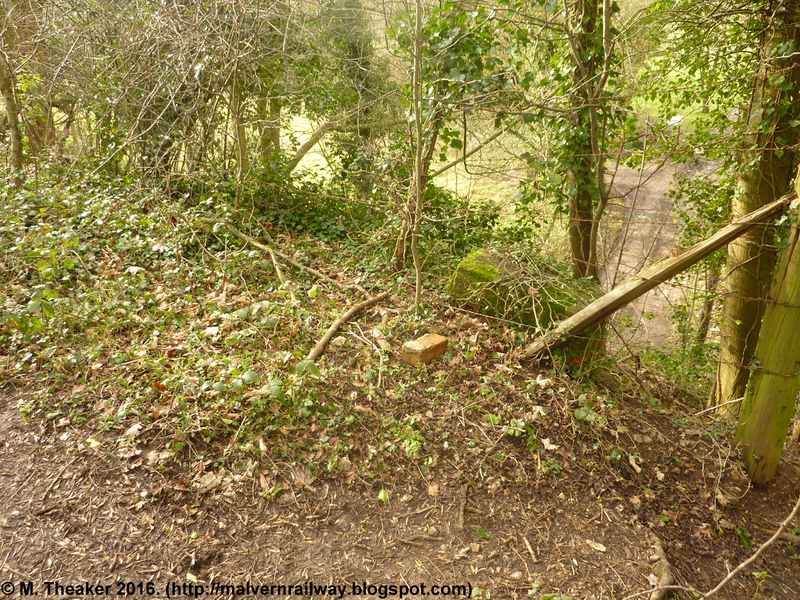 The western side of the bridge top is very overgrown, but the capstone is still visible. 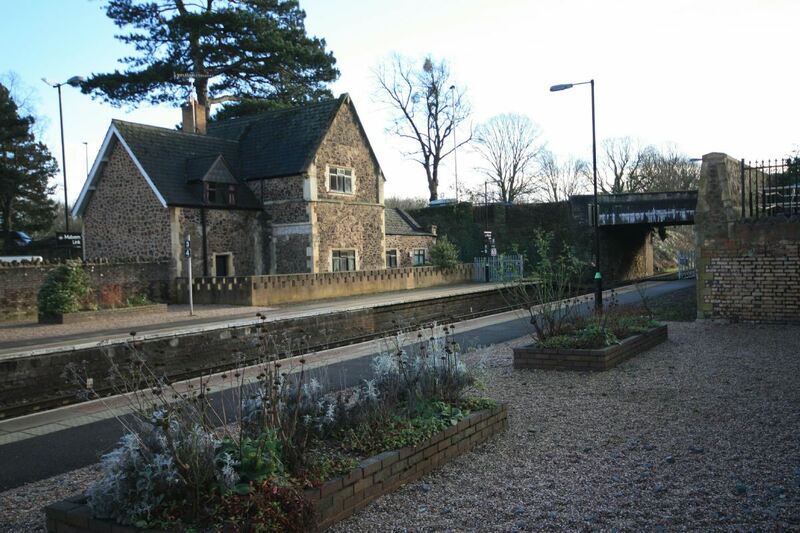 The eastern side reveals a lot more of the brickwork. A closer look at the tell-tale blue bricks. 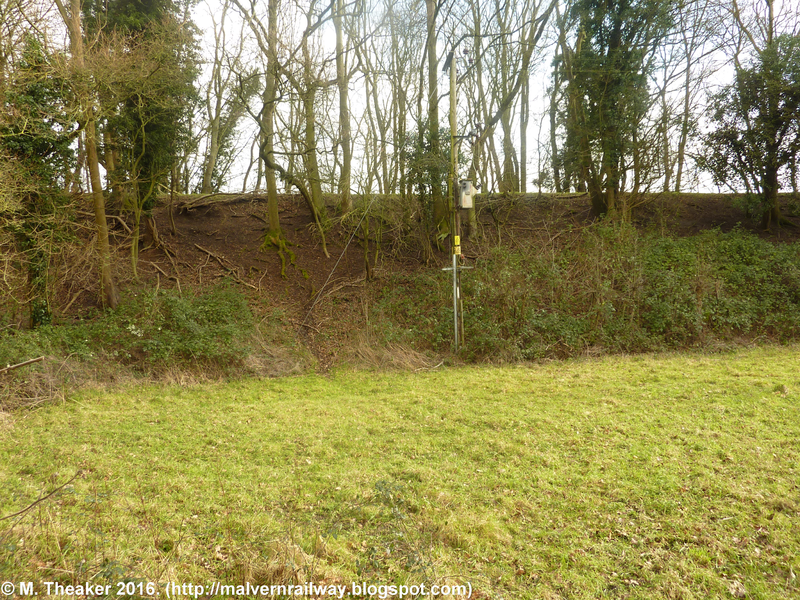 This is the high point of the embankment - as you can see, it is quite a drop onto the farm track! The bridge from the west. 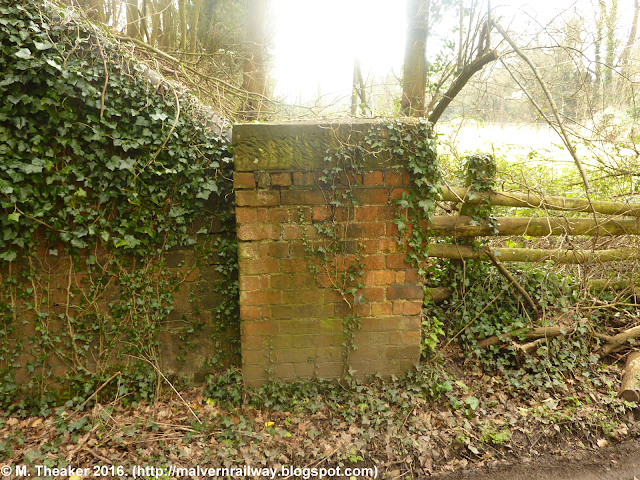 The red brick and overgrowth combine to look rather stunning! 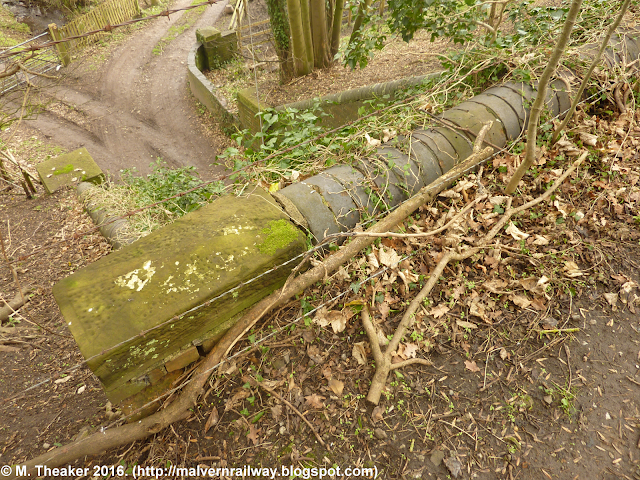 A closer look at the south-western buttress. 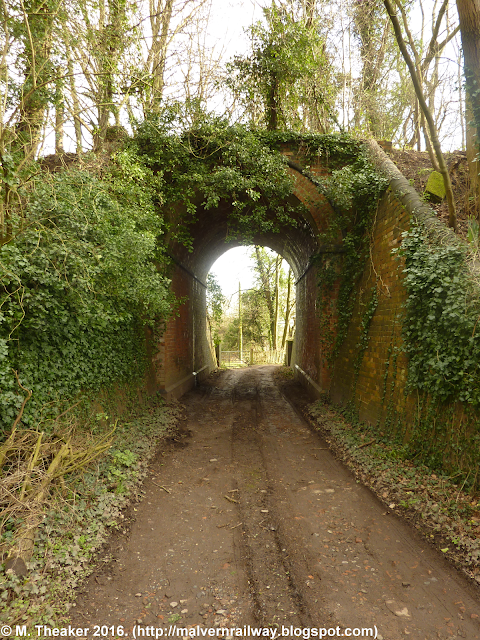 Looking through the bridge from the eastern side. 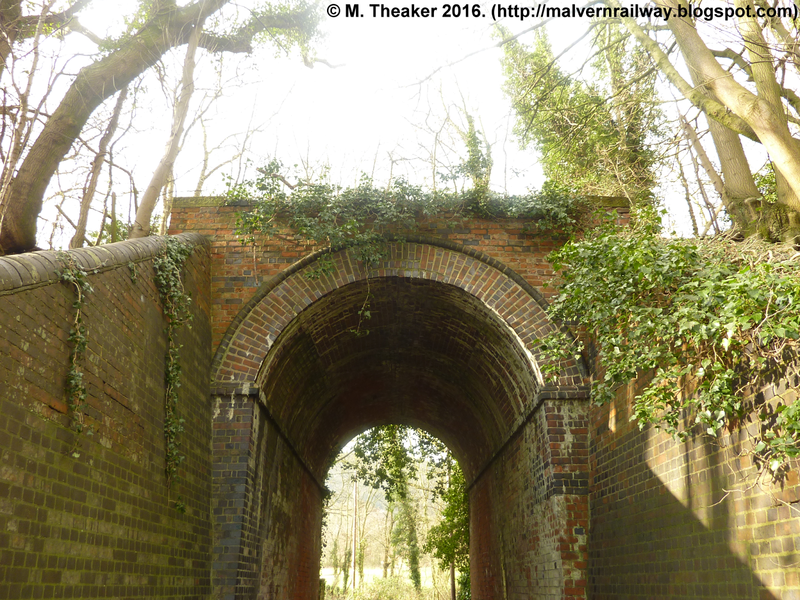 A closer look at that fantastic archway. 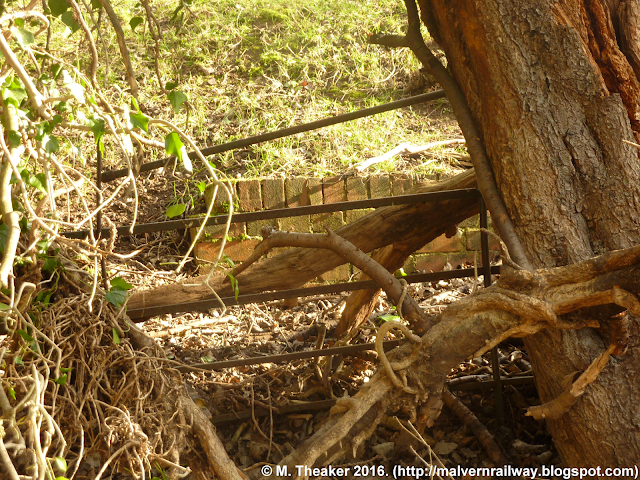 The best thing about this bridge is that it is still in use, and so has to be maintained properly. 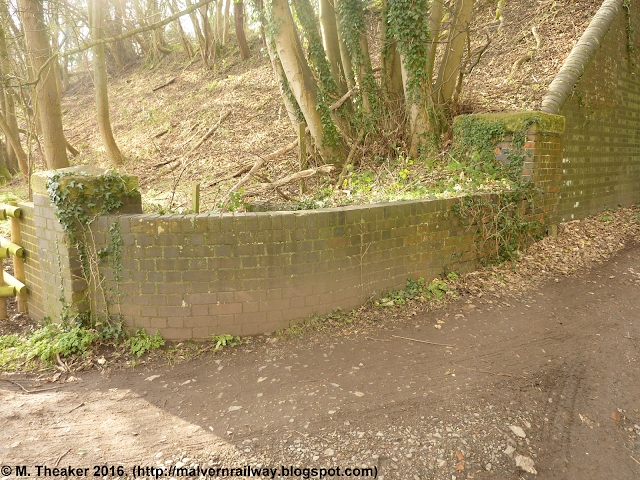 These curved walls on the eastern side of the old tracks look to have been refurbished more recently than the rest of the bridge. There are a couple of interesting remains just before the embankment fizzles out completely. 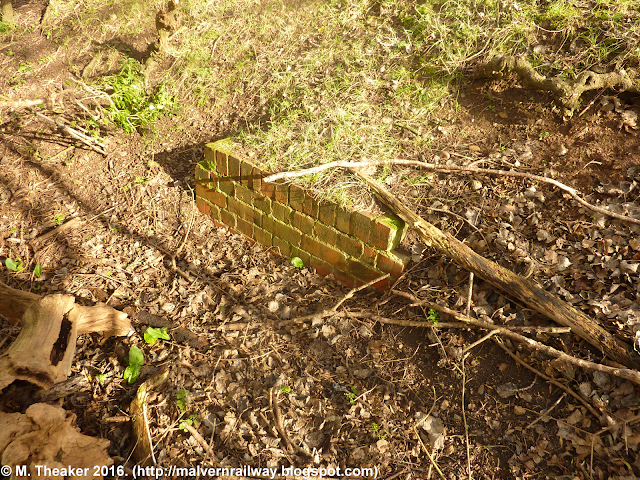 First, there is this odd pile of bricks, which I assume forms the top of another drainage channel. The bricks are obscured by the earth so I can't tell how deep they go, or if they still serve a purpose. The other interesting point is this retaining wall, which looks to have possibly been made out of old sleepers. This final picture shows the embankment from the opposite end of the previous shot, heading northwards back towards Warren Farm bridge and Malvern.